Kills 99.9% of bacteria. Powerful Flash clean and shine. Use in kitchen or bathroom on most hard, washable surfaces (see back of pack). Suitable for high chairs and food preparation areas (see back of pack). Cuts through grease and dirt. Does not contain bleach. Available in multiple scents. 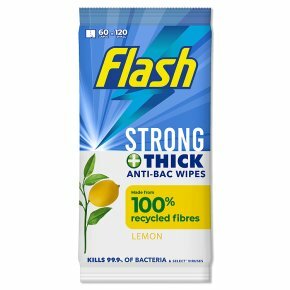 Flash cleaning wipes not only kill 99.9% of bacteria but leave a powerful clean and shine! This Ultra Power wipes are perfect for quick clean-ups all around the house or when you are away from home, they are convenient and easy to use for every day cleaning. Flash Ultra Power wipes are specially formulated to leave amazing shine, with fewer visible streaks and residues compared to our normal Flash wipes. Use the disposable wipes to more hygienically clean germy places. These multipurpose cleaning wipes quickly remove grease stains, burnt on food, dirt and soap scum, leaving a fresh smell in the room. Use the cleansing wipes to clean the kitchen, the bathroom and on all hard washable surfaces like countertops, walls, floors, oven, sink, fridge, bins, baths & taps, toilet seats, high chairs, electrical devices. Keep away from children. Keep away from eyes. If product gets into eyes rinse thoroughly with water. Rinse hands after use. Do not use for personal hygiene. Dispose residues to special<br>waste collection point.